This study discusses Islamic values revealed in students’ communication in Edmodo learning platform. It investigated whether there was the implementation of Islamic values in the conversation and responses in the learning platform, both implicitly and explicitly. This study also observed the students’ participation in the conversation platform. In the data collection, this study used observation and questionnaire, and the researcher used descriptive approach to analyze the data. There was analysis on the students’ conversation forms in the online platform. The result revealed that the students integrated Islamic values through their communication styles in the online learning activity, in the form of some short expressions and in the content of the conversations. Not only did the values appear explicitly, but they could also be noted implicitly in the sentences which contained suggestions, polite greetings, and consoling others. This study concludes that the students had been able to incorporate Islamic values they learned both formally and informally in their daily communication. Those uses of Islamic terms and the existences of Islamic values in the English online conversation made this group distinctive from other online communities. SOFA, Eros Meilina. Islamic Values in Higher Education Students’ Communication in Edmodo Learning Platform. Edukasia Islamika: Jurnal Pendidikan Islam, [S.l. ], v. 3, n. 1, p. 54-69, june 2018. ISSN 2548-5822. 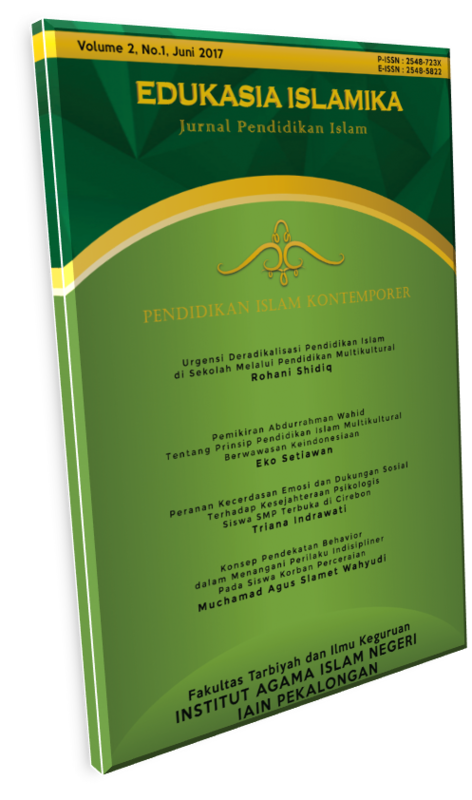 Available at: <http://e-journal.iainpekalongan.ac.id/index.php/edukasiaislamika/article/view/1302>. Date accessed: 22 apr. 2019. doi: https://doi.org/10.28918/jei.v3i1.1302.